For centuries, keloids and hypertrophic scars have been recognized as abnormal responses to trauma. Although morphologic differences between these two entities have been acknowledged for years, discovery of a histopathologic distinction is more recent. Hypertrophic scarring and keloids. 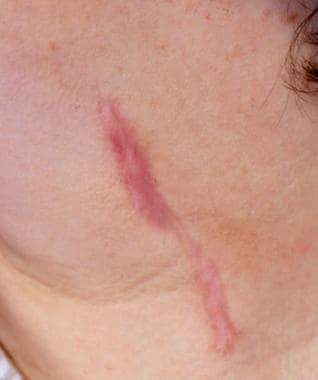 Keloid scar showing overgrowth of scar margins. Hypertrophic scarring and keloids. 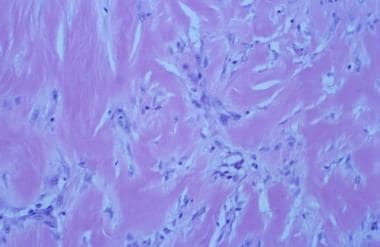 Light micrograph of keloid scar (200X) shows haphazard arrangement of fairly acellular collagen, with decreased myofibroblasts. Light micrograph courtesy of T. Brent Ponder, MD, St Louis University Anatomic Pathology. Certain areas of the body such as the sternum, deltoid region of the upper arm, and upper back, have increased susceptibility to keloid formation. These areas are also subject to elevated levels of muscle and skin tension, which may explain their association with keloids. Although levels of skin tension and motion are high in amelanotic areas, such as the palms of the hands or soles of the feet, these areas are not associated with keloids. The most common sites of keloid formation in the head and neck are the earlobes, mandibular border, and posterior neck. The earlobe is typically affected on the posteromedial surface secondary to the posterior positioning of the earring post. The central one third of the face is rarely involved. 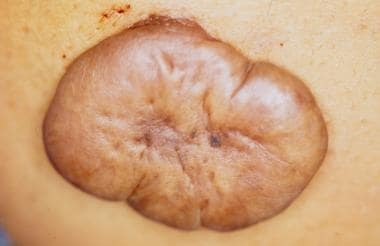 With the exception of trauma, precise etiologic factors responsible for keloid formation have not been fully elucidated. Keloids are frequently associated with negative wound healing factors, such as infection, excessive tension, foreign bodies, and repetitive trauma; however, keloids may form in simple clean wounds. The hypertrophic scar is defined as a widened or unsightly scar that does not extend beyond the original boundaries of the wound. Unlike keloids, the hypertrophic scar reaches a certain size and subsequently stabilizes or regresses. 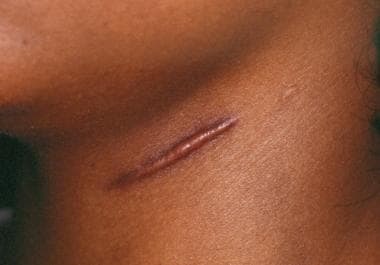 Similar to keloids, hypertrophic scars are associated with adverse wound healing factors. No racial or familial preponderance occurs with hypertrophic scarring, unlike keloid formation. Scanning electron microscopy reveals flattened collagen bundles that are parallel in orientation. Similar to keloids, a higher percentage of type III collagen is present in these scars than in normal wounds. Hypertrophic scars are more likely to occur in the same anatomic locations as keloids (eg, mandibular border), presumably because of elevated tension in these areas (see the images below). Hypertrophic scarring and keloids. Light micrograph of hypertrophic scar (200X) with collagen that is oriented parallel to skin surface and has numerous myofibroblasts. Light micrograph courtesy of T. Brent Ponder, MD, St Louis University Anatomic Pathology. Individuals of all ethnic backgrounds can form keloids and hypertrophic scars. Keloids are seen with greater frequency in blacks, Hispanics, and Asians. Prevalence in the black and Hispanic populations can be as high as 16%, and a familial predisposition is believed to exist. Keloid formation is approximately 15 times greater in highly pigmented ethnic groups than in whites. Precise etiologic factors associated with keloid formation are elusive, with the exception of tissue trauma; however, keloids have been reported in the absence of trauma. Adverse wound healing characteristics, such as infection and excessive wound tension, are associated with keloids and hypertrophic scars. The pathophysiology of keloids is not completely understood. Fibroblasts and myofibroblasts are believed to be responsible for the deposition of dense extracellular matrix consisting of collagen and glycosaminoglycans. Certain studies report an increased level of fibronectin produced by the fibroblasts within keloids. Numerous theories are postulated regarding the mechanism of keloid formation, including an allergic immunoglobulin E (IgE)–mediated response, leading to a decreased percentage of mature cross-linked collagen and an increased fraction of soluble collagen. A second theory implicates a deficiency in melanocyte-stimulating hormone (MSH) metabolism or an excess of MSH as the initiator of keloid formation. The increase in MSH and subsequent keloid formation that are associated with certain periods of life, such as pregnancy and puberty, support this theory. A third theory concerns the possibility that microvascular occlusion and subsequent hypoxia may be responsible for keloid formation. More recent studies report elevated interleukin-6 (IL-6) expression in the pathophysiology of keloids, and the role of insulinlike growth factor-1 (IGF-1) and IGF-1 receptor axis in the invasive activity of keloids. The treatment of keloids can be subdivided into surgical, nonsurgical, and combined modality treatment. Many published reports advocate a variety of therapies; however, few studies provide a coherent therapeutic plan because of poorly defined endpoints in treatment, inadequate follow-up care, failure to properly distinguish between hypertrophic scars and keloids, and lack of prospective studies. Most of the literature on keloids suggests that a high recurrence rate (50%) is expected, regardless of treatment. If located in an amenable anatomic location, hypertrophic scars can generally be treated with simple excision, providing wound closure can occur without undue tension. Steroid injections may be appropriate, depending on the particular wound and the patient. Although an injection of intralesional triamcinolone acetate usually flattens the raised scar and decreases pruritus, the discolored or atrophic appearance of the widened portion of the scar remains. Limitations of steroid treatment must be recognized by the surgeon and the patient to optimize satisfaction with the results. Steroid injections must be administered cautiously to avoid overtreatment, which may result in skin atrophy, telangiectasias, and a depressed scar. In general, scar revision with an excision and atraumatic closure and with possible reorientation of the scar by using W-plasties or Z-plasties can usually improve widened hypertrophic scars. This procedure provides a narrower scar, decreases the tension along the scar, and improves scar camouflage. The bulk of the remaining discussion focuses on various treatment methods for keloids. Keloids treated with simple excision have a recurrence rate ranging from 50-80%. The use of Z-plasties or any wound-lengthening technique for excising keloids is strongly discouraged. Complete excision and near-total excision (ie, leaving behind a small remnant of keloid on the peripheral portions of the incision) have both been advocated. The theoretical benefit of the latter is that previously uninjured tissue is not traumatized, decreasing the chances of recurrence; however, whether the residual keloid remnant contributes to further keloid development remains unclear. Wide undermining should be used to make closure of these wounds tension-free. Provided that adjacent tissue is manipulated, wide undermining may or may not increase the risk of keloid recurrence. The use of cuticular, monofilament, synthetic permanent sutures is advised to decrease tissue reaction. Tissue adhesives may provide a less reactive skin closure, which may decrease the likelihood of keloid formation. Further studies are necessary to evaluate this hypothesis. Lasers, such as carbon dioxide, pulse dye, neodymium-yttrium aluminum garnet (Nd-YAG), and argon, have been used as alternatives to cold excision for keloids; however, the use of lasers is expensive and cumbersome. Superiority of laser use to simple excision currently has not been demonstrated in clinical trials. Further research and technologic developments may enhance the effectiveness of lasers to treat keloids in the future. The application of mechanical pressure by compression devices is advocated in the treatment of keloids. Pressure may theoretically break up collagen bundles and soften the keloid mass; however, therapy must be instituted for long periods (>23 h/d for 6 mo) before significant effect can be achieved. Unfortunately, many regions of the head and neck are not amenable to pressure application. Silicone sheeting is used to decrease the irritation and pruritus associated with keloids. The proposed mechanism of action involves maintenance of scar hydration and inducement of a subsequent decrease in cytokine release, resulting in less collagen deposition. Certain authors report great success in keloid regression with this modality. Unfortunately, the general opinion on silicone sheeting does not support significant reduction in the dimensions or pigment characteristics of keloids, although silicone sheeting can be very effective in decreasing pruritus. Various therapies, including nitrogen mustard, tetroquinone, antihistamines, retinoic acids, zinc, vitamin A, vitamin E, and verapamil, have been used with varying degrees of success. Interferon (IFN) therapy is used because of its ability to reduce collagen synthesis in dermal fibroblasts. Granstein et al reported a 30% reduction in keloid height after intralesional injections of IFN-gamma 3 times weekly for 3 weeks. As with other treatment modalities, some recurrences are to be expected. IFN has untoward adverse effects, including low-grade fevers, a flulike illness for 48-72 hours after injection, and pain on injection. One of the most commonly used combination therapies employs cold-knife excision followed by postoperative injection of intralesional steroid. The injection into the lesion typically occurs 2-3 weeks postoperatively, followed by repeat injection in 3-4 weeks. Preoperative or intraoperative steroid injection may delay wound healing and increase the possibility of wound dehiscence. The most commonly used form of steroid is triamcinolone suspension; however, dexamethasone and cortisone can also be used. A concentration of 10 mg/mL of triamcinolone is used as the starting point and can be increased to as high as 40 mg/mL for denser, more recalcitrant keloids. The lower dose is preferred because of the potential complications of intralesional steroids, including depigmentation and dermal atrophy. The literature, confirmed by clinical experience, reports a negligible incidence of systemic effects. A combination of surgical excision and external beam radiotherapy is implemented in certain centers. Radiation therapy adversely affects fibroblast growth and collagen production. Sclafani et al conducted a randomized prospective trial comparing keloid excision followed by intralesional steroid injection with keloid excision followed by radiotherapy. Results of the study did not demonstrate statistical significance but were able to show a trend toward a lower recurrence rate in the radiated group. The typical dosing range for external beam radiotherapy is 700-1500 cGy administered within 1 week of excisional surgery. A second method of radiation therapy involves the use of interstitial iridium 192 high-dose-rate brachytherapy. [14, 15] Some authors report that the immediate timing of radiation therapy may actually improve patient compliance. The disadvantages of treating a benign process with radiation include the potential of inducing thyroid or salivary gland neoplasia, which has a latency period of 15-20 years. Shielding techniques are used to safeguard against such occurrences but should not be considered foolproof. In areas where the surrounding normal structures can be adequately shielded (eg, the earlobes), radiation therapy is a reasonable and viable option. Keloids and hypertrophic scars are distinguishable by their gross and electron-microscopic appearances. Keloids are typically associated with more highly pigmented ethnic groups and can have a familial association. Keloids and hypertrophic scars are both associated with adverse wound healing factors, such as infection and excessive tension. Keloids are more likely to occur in areas of the body associated with a high level of muscle tension. In the head and neck, the earlobe and mandibular border are most commonly affected. The high recurrence rate of keloids has initiated a wide variety of different treatment approaches. Thus far, convincing evidence does not exist to recommend any therapy over surgical excision followed by sequential intralesional steroid injections; however, well-controlled studies on the treatment of keloids are rare. Radiation therapy is reserved for keloids recalcitrant to conventional therapy. The favored treatment regimen for hypertrophic scars is surgical excision. The response is generally more favorable than that with keloids, as long as the initial negative influences on healing are not reproduced. The use of intralesional steroid injections in hypertrophic scarring remains questionable. The risks and benefits must be weighed and clearly explained to the patient. 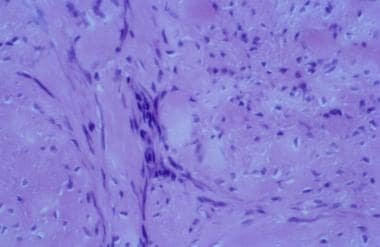 Although there has been a paucity of prospective basic science research and clinical trials related to keloid and hypertrophic scars, recent interest in genetic factors will hopefully increase the number and quality of studies in these abnormalities, which can have a high negative psychological and functional toll on patients. McGinty S, Siddiqui WJ. Keloid. 2018 Jan. [Medline]. [Full Text]. Touchi R, Ueda K, Kurokawa N, Tsuji M. Central regions of keloids are severely ischaemic. J Plast Reconstr Aesthet Surg. 2016 Feb. 69 (2):e35-41. [Medline]. Ogawa R, Okai K, Tokumura F, Mori K, Ohmori Y, Huang C, et al. The relationship between skin stretching/contraction and pathologic scarring: the important role of mechanical forces in keloid generation. Wound Repair Regen. 2012 Mar-Apr. 20(2):149-57. [Medline]. De Felice B, Ciarmiello LF, Mondola P, Damiano S, Seru R, Argenziano C, et al. Differential p63 and p53 expression in human keloid fibroblasts and hypertrophic scar fibroblasts. DNA Cell Biol. Aug 2007. 26(8):541-7. [Medline]. [Full Text]. Lu YY, Lu CC, Yu WW, et al. Keloid risk in patients with atopic dermatitis: a nationwide retrospective cohort study in Taiwan. BMJ Open. 2018 Jul 18. 8 (7):e022865. [Medline]. [Full Text]. Akaishi S, Koike S, Dohi T, Kobe K, Hyakusoku H, Ogawa R. Nd:YAG Laser Treatment of Keloids and Hypertrophic Scars. Eplasty. 2012. 12:e1. [Medline]. [Full Text]. Capon A, Iarmarcovai G, Mordon S. Laser-assisted skin healing (LASH) in hypertrophic scar revision. J Cosmet Laser Ther. 2009 Dec. 11(4):220-3. [Medline]. Zouboulis CC, Blume U, Buttner P, et al. Outcomes of cryosurgery in keloids and hypertrophic scars. A prospective consecutive trial of case series. Arch Dermatol. 1993 Sep. 129(9):1146-51. [Medline]. Mourad B, Elfar N, Elsheikh S. Spray versus intralesional cryotherapy for keloids. J Dermatolog Treat. 2016 Jun. 27 (3):264-9. [Medline]. O'Boyle CP, Shayan-Arani H, Hamada MW. Intralesional cryotherapy for hypertrophic scars and keloids: a review. Scars Burn Heal. 2017 Jan-Dec. 3:2059513117702162. [Medline]. [Full Text]. Granstein RD, Rook A, Flotte TJ. A controlled trial of intralesional recombinant interferon-gamma in the treatment of keloidal scarring. Clinical and histologic findings. Arch Dermatol. 1990 Oct. 126(10):1295-302. [Medline]. Hayashi T, Furukawa H, Oyama A, Funayama E, Saito A, Murao N, et al. A new uniform protocol of combined corticosteroid injections and ointment application reduces recurrence rates after surgical keloid/hypertrophic scar excision. Dermatol Surg. 2012 Jun. 38(6):893-7. [Medline]. Sclafani AP, Gordon L, Chadha M, et al. Prevention of earlobe keloid recurrence with postoperative corticosteroid injections versus radiation therapy: a randomized, prospective study and review of the literature. Dermatol Surg. 1996 Jun. 22(6):569-74. [Medline]. Goutos I, Ogawa R. Brachytherapy in the adjuvant management of keloid scars: literature review. Scars Burn Heal. 2017 Jan-Dec. 3:2059513117735483. [Medline]. [Full Text]. De Cicco L, Vischioni B, Vavassori A, et al. Postoperative management of keloids: low-dose-rate and high-dose-rate brachytherapy. Brachytherapy. 2014 Sep-Oct. 13(5):508-13. [Medline].